This is a 2 in 1 tiny clip-on detachable HD lens for mobile phones & digital cameras. With the macro lens, can be taken close-up picture of a tiny object clearly in the details. Wide-angle lens is suitable to take picture of large ranges, such group of people, buildings and landscape. New design universal clip can attach every 37MM Thread Digital SLR Pro Lens on your mobile. Turn your mobile into DSLR Camera easily. Bigger than bigger. Professional HD Lens reduces glass flare & ghosting caused by reflections. Top-grade aluminum construction increases the durability of the product and let TECHO Lens Kit be your partner of photography. Universal detachable clamp design, work on most types of mobile phone that the distance between its camera lens and its top is less than 1 inch. Suitable for most mobile phones, easy and convenient to operate. Smart phone lenses can apply for iPhone 7 / 6s / 6s Plus / 6 / 6 Plus / 5s / 4 / 4s / SE, iPad Air, iPad Mini, iPod Touch, Samsung Galaxy S7 Edge/S7/S6/S5/S4/S3/A7/A5/A3/J5/J3, Galaxy Note 4, Huawei, Sony Xperia, HTC, LG, Motorola smart phone, Tablet PC or anywhere you can imagine. NOTE: 1.when use Macro Lens, suggest keeping 1-3 inches distance from your object to take more clear pictures. 2.The Macro Lens and the Wide-angle Lens are attached together while you receive the phone camera lens set. Do you desire to take photos without a heavy camera? 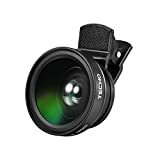 TECHO 2 in 1 smartphone clip-on lens set will be your smart choice! Wide-angle lens:0.45X wide angle lens allows more of the scene to be included in the photograph, which is useful in architectural, interior and landscape photography. Macro lens:12.5X Macro lens helps to take sharp pictures as close as 50mm from the subject (perfect for flowers, coins, insects, etc.). New design universal clip can attach any 37MM Thread Digital SLR Pro Lens on your mobile. Premium Rimmed Glass: High quality rimmed glass reduces light reflection around lens edge. Professional High Definition: PHD Lens reduces glass flare & ghosting caused by reflections. Anyone with a smartphone or tablet can benefit from the fun set. Simply screw the lens on the clip and clip to your smartphone rear (or front) camera. Work on most types of mobile phone that the distance between its camera lens and its top is less than 2 cm. This entry was posted in Discount Photography and tagged 0.45x, 12.5X, Angle, Camera, iPhone, lens, Macro, Mobile, Phone, Plus+, Professional, Samsung, Super, TECHO, Universal, Wide by Ball Photo. Bookmark the permalink.